Liz currently directs two local flute ensembles, providing fun friendship for flute players. If you enjoy playing but have never played with other flutes you'll find it is great fun and the range of pieces we can tackle and the sound we can make playing as a group, adding alto, bass and picolos is fantastic! Come along and have a go at either our Bedfordshire Flute Ensemble which meets on a Monday evening in Barton-le-Clay or our Hertfordshire Flute Ensemble which meets on Wednesday evenings in Harpenden. 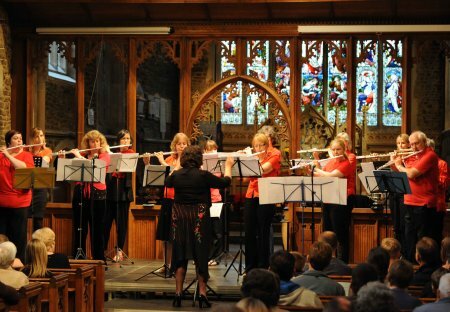 This group (formerly known as Hitchin Flutes) is intended for all enthusiastic flautists of Grade 3 and above who wish to experience playing a varied yet extensive repertoire of Flute Choir music. 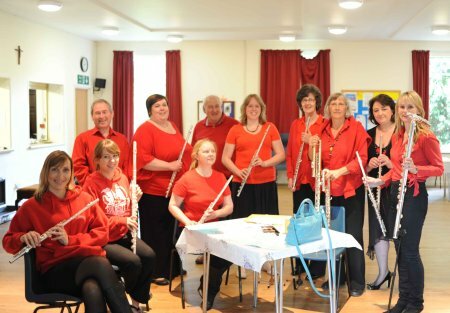 The group was founded by Liz Childs in 2006 and has performed regularly in and around Hitchin, often for charity functions but also in concert, most notably in the Hitchin Festival. No audition required just an enthusiastic and committed approach. The group comprises many adults who have thoroughly enjoyed resurrecting their flute playing, after several years in some cases, of not having played very much. The group uses the full range of flutes and rehearses to the highest possible standards. Please enjoy browsing through the Gallery and email Liz Childs for further information. No audition required and the group exists to promote the enjoyment of flute playing for flautists of all ages and abilities. For further information email Liz Childs or call her directly on 07711 080275.